Quarter zip men's jacket with YC embroidered on left chest. Champion reverse weave shorts are cut on the cross grain to resist vertical shrinkage and lasting fit, tapered 11" inseam, stretch ribbed gusset in the crotch, elastic waist with inner adjustable drawcord, and deeper on-seam pockets. Our Champion quarter zip sweater has a Y(spartan head)C design on the left chest pocket. It also keeps you warm and comfortable during the winter months. Our Champion sweatpants, have a YC Spartan imprint on the left hip and are also spark tapered. Our Champion hoodie has York College on the chest with Spartans 1787 underneath. Just an everyday Champion classic Spartan tee. Champion St. Patrick's Day tee with York College arched over a shamrock and Spartans imprinted on the front chest. Champion hooded sweatshirt features Powerblend fleece that resists pilling and shrinkage, triple stitching reinforces seams for durability, two-ply hood with drawcord, half moon neck facing for no irritation, ribbed cuff and waistband, and front pouch pocket. Cannot celebrate the holidays without our Champion Ugly Spartan tee. Champion short sleeve T-shirt featuring York College arched over Spartans and the YC Spartan logo. Fall and winter just got a little warmer thanks to this Champion hoodie. 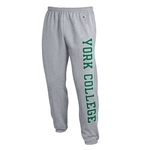 With YCP on the chest and SPARTANS in the C.
Champion hooded sweatshirt with York College stacked over 1787 in felt. These Champion sweatpants are designed for comfort. With York College written down the left leg. Our Champion athletic fit sweatshirt has a pouch pocket, a grey mesh hood, and self cuffs and waistband. Champion Quarter-Zip Jacket offers a mock neck for comfort and durability, screen printed York College of Pennsylvania logo on the left chest, a covered zipper, and long sleeve cuffed hem. Unisex heavyweight crewneck sweatshirt with double layer rib knit trim at neck, cuffs, waist, and side panels. Unisex heavyweight hooded sweatshirt with front pouch and double layer rib knit trim at neck, cuffs, waist, and side panels. A classic pullover sweatshirt with a 1x1 rib at the cuff, waistband and side panels, and a jersey lined hood, as well as a kanga pocket for storage. Champion athletic short sleeve tee is comfortable and looks great all day, features a self-collar. This Champion short sleeve tee is imprinted with the York College logo and says Spartans underneath. Comes in dark green.